Only touch the tips of nettles with your bear hands. The new young tips are not stingy, it is the older leaves and hairy stalk that cause the pain. 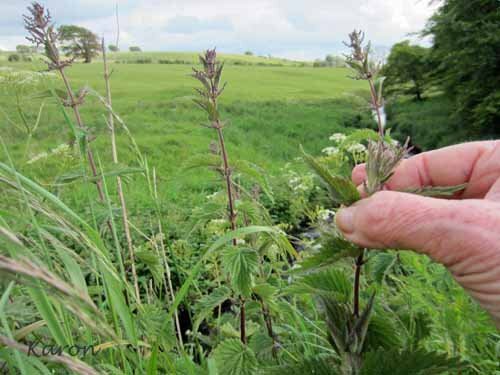 Put a handful of nettle tops in a glass jug and pour over boiling water. Leave for at least 20 minutes to cool completely. Strain out the plant matter. Use this nettle water as the final rinse (you can catch the rinse in a basin and pour over again) after shampooing your hair. Perfect for damaged and overly treated hair.